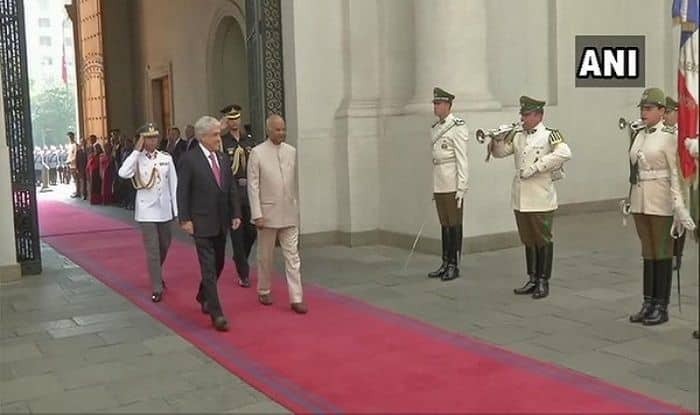 The bilateral talks between India and Chile concluded on Monday after the two nations signed three MoUs in the fields of mining, culture and disability. New Delhi: President Ram Nath Kovind and his Chilean counterpart Sebastian Pinera have signed three Memoranda of Understanding (MoUs) in the fields of mining, culture and disability. The agreement comes after a detailed discussion on wide-ranging issues of mutual interest on Monday. During the bilateral talks between the two nations, the President of Chile announced that their country will allow visa-free entry to Indian nationals who hold a valid visa of the United States of America. The leaders also agreed to promote the cultural and business ties between the two nations. Notably, President Kovind thanked Pinera for his strong condemnation of the Pulwama terror attack in Jammu and Kashmir. The two countries have also agreed to work together to strengthen the global response to defeat and destroy terrorism in all its forms and manifestations. In addition, both India and Chile agreed to explore opportunities for other cooperation in the defence, space research and explorations. In celebration of the 70 years of bilateral relationship between India and Chile, Sebastian Piera tweeted that both the countries had mutually agreed and held talks in the fields of mining, culture and disability. He added that steps will be taken to enhance open markets, protect investments and avoid double taxation for further development in both countries. On the same day, President Kovind addressed students and faculty of the University of Chile on the topic ‘Gandhi for the Young’. The University also presented a Rectoral Medal to the President. Researchers from the University of Chile briefed the President on “Strategy for the development of a space programme for Chile”. The President interacted with scientists, including those who were involved in building Chile’s nanosatellite, which India Space Research Organisation (ISRO) launched in 2017. President Kovind also addressed the India-Chile Business roundtable in Santiago and said that Chile is India’s window to Latin America and to the Pacific Alliance. The President invited Chile’s sovereign funds to invest in the Indian infrastructure sector. “As we depart from Chile, the First Lady and I would like to thank President @sebastianpinera and the friendly people of Chile for their warmth and affection. May our ties grow as tall as the Andes and Himalayas,” the President tweeted on Tuesday. President Kovind’s three-nation tour that included Bolivia and Croatia also, concluded with Chile. The President had visited Croatia and Bolivia from March 25 to March 30.